What is it? A band of mercenaries and misfits, you set out on an errand to find more than you were bargaining for. But plucky and canny as you are, you learn to sharpen your senses as well as your blades. 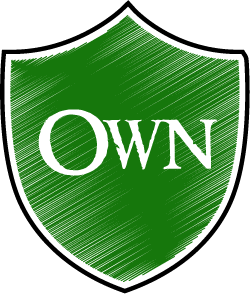 Face a number of enemies and challenges in this card-driven combat-oriented game, through a developing campaign of engaging stories and memorable characters. The choices you make now will determine not only your own fate, but that of Gloomhaven. It is all down to little ratty me. My fellow traveller, Jannit, is too tired to go on. Still, she offers a fading cheer with her vaporizing breath here in the ice canyon. Fine Jannit. Thanks for that Jannit, but this is my last move and there are still two enemies staring me down … or possibly not. One of them might be persuaded to take a sudden but categorical dislike to his “friend”. What, after all, have dogs ever done for ghosts? I pour my cunning into the spectre’s mind and goad these two remaining foes into fighting among themselves. I am sorry to say that it ended badly for the dog, but it could not be helped. Subsequently, I strike at the ghostly traitor, and he gets my fist in what may pass for his teeth. As luck would have it the stars in my cards align to give me the boost that finishes him off. Nail-biting. Things could have turned out very differently. 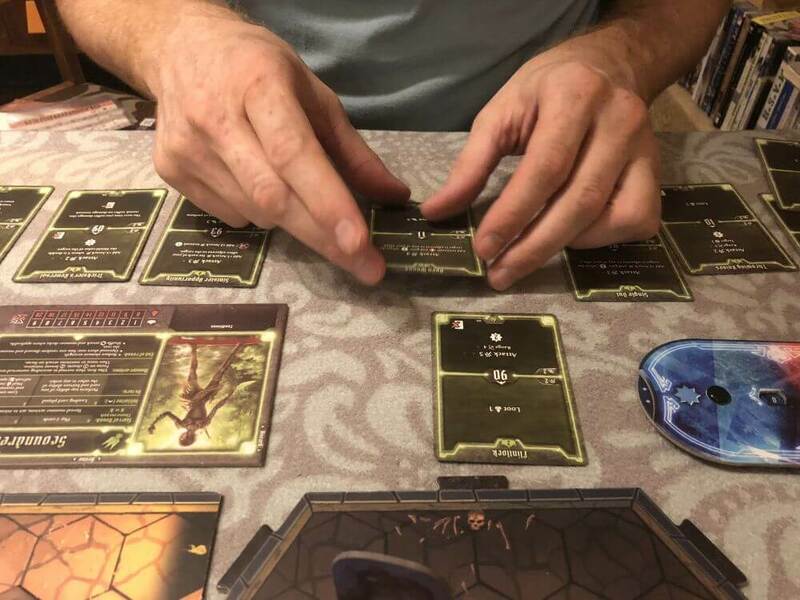 This is how our latest scenario of Gloomhaven concluded, with our fists in the air punctuating yelps of surprise and relief, but it is not unusual. Many of our sessions have had tight endings or surprise twists, yet each time for unique reasons and in different ways. These stories, as they unfold in each session, have me properly gripped and keen for more. “Can we play Gloomhaven tonight?” is a phrase Jannit’s controller is by now expecting to hear. 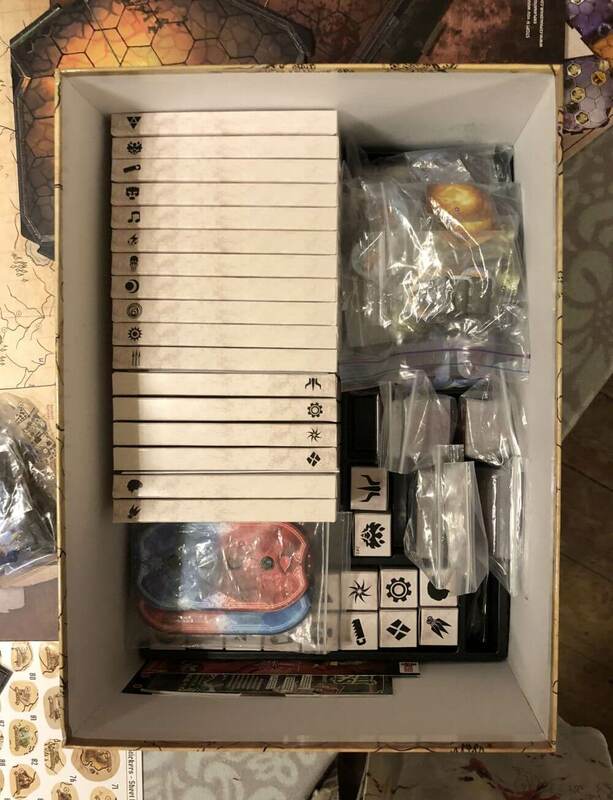 Spoiler alert: This review of Gloomhaven is by an acolyte. I adore it. Gloomhaven is a campaign game founded on a series of quests that lead you to visit premade dungeon scenarios. If so-called dungeon crawling does not appeal, this game is not for you. Isaac Childres relates that the inception of Gloomhaven lay in his love of storytelling, particularly the interactive or non-linear kind. Good stories, especially in fantasy settings, often rely on a rich environment where incidents and actors that are not necessarily on the page, shape the world the protagonists attempt to navigate. Gloomhaven models this principle in its stride. At the start of the campaign, you know very little about this world which reveals itself to you through gameplay. What you do know however, is that you are hungry and poor, and since you have been spending your nights and money in an inn, likely hungover. A misfit and outcast, you have already proven your proficiency at splitting chins. In short, you are a noted mercenary, and this fact alone leads a certain rich patron to seek you out for an errand that will eventually lead you to explore the extensive landscape of caves, quarries, marshes and mountains. Mead lowers inhibition, and consequently you have made what some might call friends, but you still sleep with your knife under your pillow. A variety of races are available for your party to play, yet you may be relieved to hear that no elves or orcs tread these lands. Instead, you have (among others) mind-controlling rat-like beings called Vermlings, diminutive but mechanically adept Quatryls, magical but disheartened (quite literally) Savvas Craghearts and, oh yes, humans. There are more, but most of these are only revealed once you have proceeded into the story a fair extent. With this assortment of characters, suspicion abounds and party alliance is threadbare. Pretty soon however you will encounter demons, cultists, bones and dragons in the dungeons, and what lies ahead can only be bad news. The central impetus of the game is to play through the interactive non-linear story that Childres has created. In a mission, you will need to clear a dungeon, loot some treasure chests, or kill a specific boss. Successfully completing a scenario presents you with a set of choices that in ever widening divergence leads you further into possible states of the overarching story. While the action of Gloomhaven happens mostly in the dungeons, events in town and en route to the scenario will affect your character and party in both the short and long term. Each of your sessions will start with reading the story text for the dungeon you are about to visit, and once you are in, you need to puzzle your way through it. Do you kill everyone, or try and race for the end goal, risking a motley pursuant mob overwhelming you before you can realise your aspirations? Following the story to its conclusion requires substantial investment. At a generous estimation, finishing the campaign will take in the order of fifty to seventy-five sessions of around two to four hours each, depending on the party size. This might sound ambitious for a casual game group, but here the game system allows much leeway. You need not obtain signed contracts from or physical restraints for your gaming group, as your party does not have to stay the same size or even play the same characters for the duration of the campaign. If your character falls behind in XP, the prosperity of the town will automatically propel you to a higher level. The level to which the campaign has been unlocked similarly adjusts the creation of new characters, including ones that you only unlock later. This all has the effect that it is gratifyingly easy to drop in or out of the campaign, miss a few sessions and jump back in without the party balance careening off a cliff. Nevertheless, in my experience, the game provides more than enough glue on the seat for your fellow gamers. 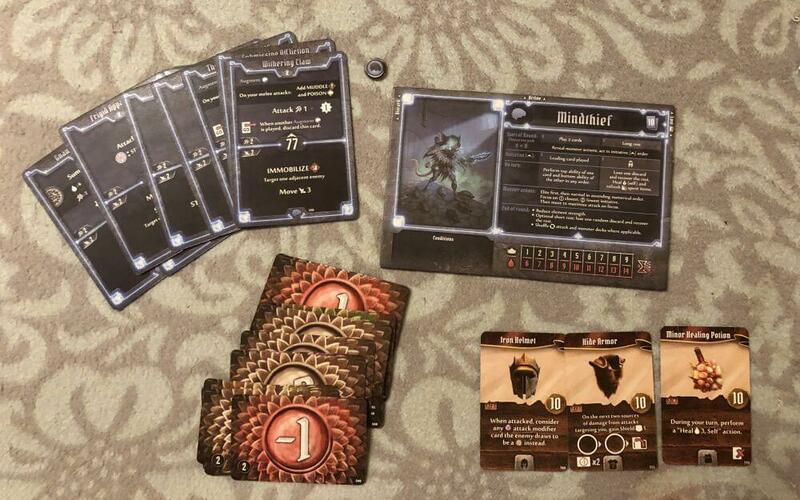 While much of the general experience of playing Gloomhaven will be familiar to anyone who has played dungeon crawler board games, Dungeons and Dragons or even computer role-playing games, its distinctive appeal resides in the card-driven combat mechanic: You have a set of cards in your hand the number of which is limited by your character class choice. These cards have abilities (including attack and heal, but also some crowd-control, buffs / debuffs, AoE, and the like) to which you have access on your turn. You choose which cards make up your hand from a larger pool of available ones, which expands as you level up. In this way you get to build your character in the style that you most enjoy playing, or what would be best suited to the party as a whole. You would do well to remember however that selfishness is a quality that does not routinely get punished in this world, so do not be afraid to act in your own interests! Once in the dungeon, at the start of a round, you secretly choose two cards to play for their abilities – you can use one from the top half of a card, and the one from the bottom of the other card. Depending on the abilities themselves, those cards are now completely lost for the rest of the scenario, or just unavailable until you take a rest, an action that also causes you to lose a card. When you have no more cards, and cannot rest, you are exhausted, as Jannit demonstrated in my opening vignette. After players have selected their cards, initiative is determined, and the pawns start to move. When your turn arrives, the reality on the board might be very different to what you imagined and you may have to look again at those two cards to see if there is not a better way of using them. More often than not, there is. Choosing cards in secret means you have control over your character, so it is not likely or really possible to have much of an alpha-player problem. The changeable game state however brings you fully back into co-operation mode, as you and your teammates debate strategy. Again, they will have their own reasons for making particular suggestions, so be advised that you can never really, truly trust anyone. A popular example: loot does not get shared, and coins that have not been picked up is lost after the scenario ends – thus keep an eye out for someone who might be more interested in a little extra pocket money than saving your heroic chops. If the actual card playing dynamic is the game’s most remarkable feature, it gains a great deal from a very finely developed superstructure. Isaac Childres’s design of the game’s AI, in the form of monster characteristics and abilities, is a pleasure to engage. The story arc you follow (determined by choices you make as a party and as an individual character) is fun and immersive, and the writing is fairly good. Nothing ground-breaking here though, just solid and enjoyable fantasy fare. When you make a choice on the randomly drawn road/city events, you could potentially gain reputation, resulting in discount from the Gloomhaven all-purpose corner shop. Or, if your baser instincts take over, you could lose reputation but become richer, gain a shadowy contact or who knows? Are you a devoted worshipper who makes offerings of gold coins at the tree? Maybe looking into a cave will reveal a new item that you would not have found had you kept your nose out of other people’s business! All these things matter to some extent, and will vary according to your style and preference, but nothing is more important than your character. I am rather deeply attached to my character(s), and invested in tweaking her as finely as possible. Apart from the cards you unlock as you level up, you also gain the option to enhance your cards, albeit for a rather large fee. At the very start of your adventure you choose a life goal from two randomly drawn options. This will further affect how you play and what decisions you are likely to make. In Gloomhaven however, love does not last, and once you fulfil your life goal your character waves a teary goodbye to your party and retires into a life of well-deserved idleness. Fear not, for the heart is fickle. Retirement unlocks a new character for you to play and fret over, and now you can peak into one of those tantalizing closed boxes and open the sealed town records. Gloomhaven includes some legacy elements, but is not fundamentally a legacy game in the vein of Pandemic Legacy, the crowd pleaser Gloomhaven dethroned to claim top spot on BGG. True, you put stickers on the map for scenarios you have unlocked and achievements you have earned, and these move the story along for your party. You can still elect to play in casual mode to return to previously unlocked scenarios, or you can make use of one of the useful digital resources available online to track the progress of different parties. The game remains playable after you have completed the campaign in either casual or campaign modes. 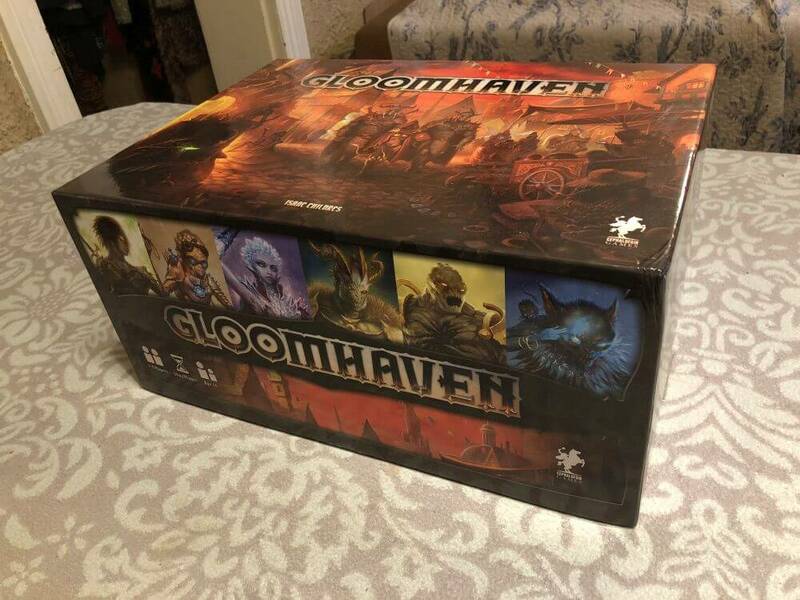 The combination of these elements of Gloomhaven lends to the world less of a sense of randomness than unpredictability, while all the time equipping you with the means to react. It’s extensive set of levers and switches (speaking in terms of game mechanics) means that there is always a trade-off. There are no clear, easily determined strategies, as you constantly have to make the best of what you have effectively given yourself. Having said that, it seems to me almost always advisable to keep your hand size as large as possible for most of the scenario. Judging when to burn a card is key to beating scenarios, or at least just surviving them. But even to this there is an exception. I was horrified when we started a campaign that included a spellweaver who happily shot off powerful attacks, having then to put those cards in the dreaded lost pile. I thought she would be gone before we cleared the first room, but was proven wrong when she pulled out a card that let her gain lost cards back into her hand. This ability, together with the tinkerer’s card that lets an ally gain cards back, means that she can play with far more impunity than the miserly mind-thief. What is good for the goose is evidently not good for the clothy DPS merchant. To my mind, Childres has produced a real gem, a game that has ignited in me a sustained fever to keep playing, as well as a growing admiration for its elegance on micro and macro levels. Quite likely its worst enemy is its most ardent fans. The enormous hype accompanying the second printing has led to unrealistic expectations and some backlash, a phenomenon we have seen before in board gaming. It does take a while to learn the mechanics, and unpacking and sorting out the wealth of cardboard bits will keep you occupied for a couple of hours at the least. This process delays the moment when you can start living the great stories Gloomers like to tell, and might be one of the reasons some people are disheartened at the outset. In addition, there is some fiddly admin to take care of. Careful sorting takes care of the latter issue, while internalizing the rules happen fairly fast once you get going with game play. It is useful to know this going in, and allow yourself the time to settle in, for this game does chomp up great chunks of your time. Even if it is not the eight-hour event game of Twilight Imperium ilk, with around fifty scenarios in the main storyline and around an additional twenty-five side quests, the campaign will take a fair chunk of your time, and if you are lucky, your heart. For some (this reviewer included) the promise of long-term play is a significant aspect of its appeal, while others might desire something more immediate and manageable. And, even though you get a lot of value for the admittedly high price point, gamers hoping for something with elaborately modelled minis, ala dudes-on-a-map, will not find it here. Ultimately, Gloomhaven is not, nor does it try to be, competition for the more baroque titles that have achieved considerable popularity of late. It does not shove its alluring shapes into your consciousness and demand you love it simply for trying so hard. Theme here is to be found in the evolving story, which invites mental and emotional investment in the world and your character, rather than in ornate illustration. Scenarios each have a unique feel to them – this is not a grind, I repeat, this is not a grind. Thus, as with every game, it cannot satisfy everyone, but I would venture it will please many and varied players. Gloomhaven allows a great deal of leeway to play in the way that you want, and adapts itself to you. It can be hard and strict or casual and social while remaining a satisfying experience. It has story and fantasy for the “Amerithrash” minded, but the combat is a puzzle that should please Eurogamers. 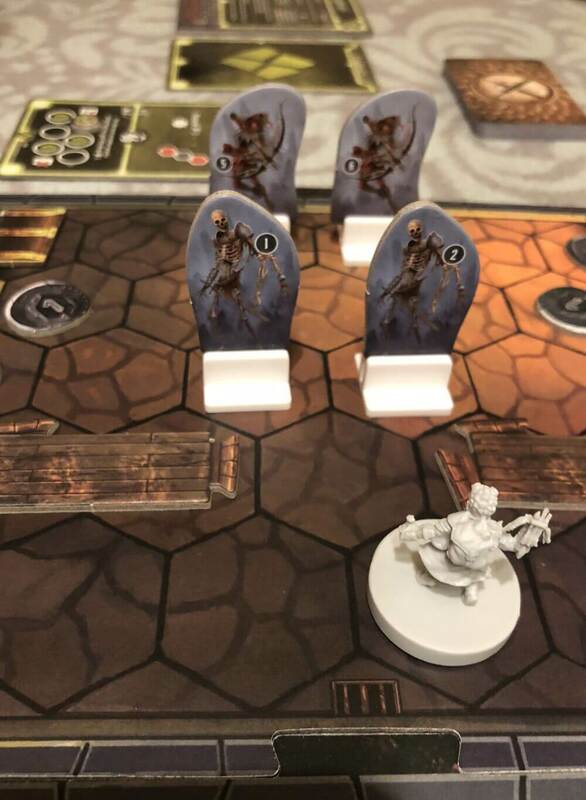 For this versatility alone, Gloomhaven deserves the praise that has been heaped on it. But the best praise it can elicit is captured in the feeling you will have when you are deep in the dark dungeon, cards having dwindled, allies lying heaving and defeated on the floor, with only your ingenuity left to get out alive. 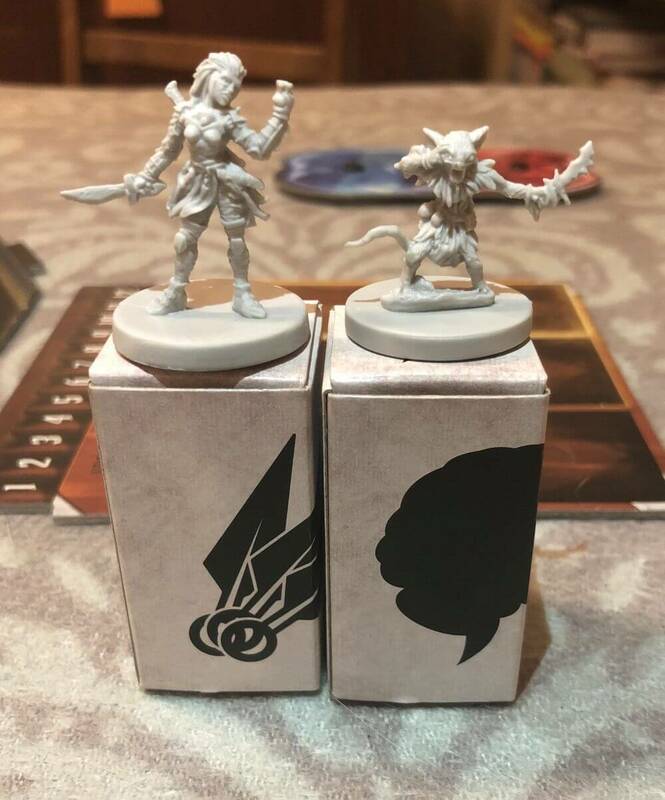 While dungeon crawling board games are a well-represented genre, Gloomhaven’s unique contribution lies in the design of the various decks that determine gameplay on all levels in a manner that is impressively integrated. The effect of the card driven game system is that there is control and chaos, surprise and close calls, fear and jubilation, in equal measure. When we play, I am always immersed at once, trying to solve the puzzle collaboratively while scheming against my own party, cynical and optimistic about our chances of success and invested in the outcome. It is immensely rewarding.